CHOC Children’s offers one of the largest pediatric pacemaker and implantable cardioverter defibrillator (ICD) programs in the region. 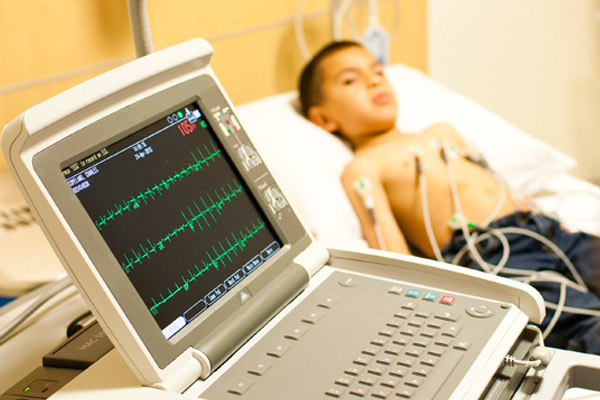 We work with children and families throughout Southern California and beyond to treat and monitor children who need a pacemaker or implantable cardioverter defibrillator. Once a device has been inserted, we provide our patients remote monitoring. Our specialists are able to monitor each patient’s defibrillator, battery supply, wire integrity and much more without the patient ever having to leave the comfort of home using a special wireless connection and the Internet. Devices are monitored every one to three months depending upon the device, or even more frequently should a child or his or her caregiver think that something just isn’t right. Our specialists are even able to work with patients and monitor their pacemaker or defibrillators if they have left the state or country while on vacation or away at college. In addition, we host a yearly pacemaker and implanted defibrillator device family support and educational reunion at which families have the opportunity to meet others in similar situations. This unique experience offers parents and patients of all ages the chance to openly discuss what they are going through. This can be particularly meaningful for patients who have survived sudden cardiac arrest. When parents and patients can meet others in the same situation, they create priceless bonds of friendship and support. CHOC Children’s is one of the first hospitals in the country to offer a minimally invasive ICD that shocks the heart without even touching it. For children and young adults with arrhythmias, an implantable cardioverter defibrillator (ICD) is a treatment option that delivers an electrical pulse to the heart when it needs it. A traditional ICD is implanted with wires threaded through the veins to the heart. At CHOC, our specially trained cardiologists now offer a subcutaneous ICD for patients with certain conditions. 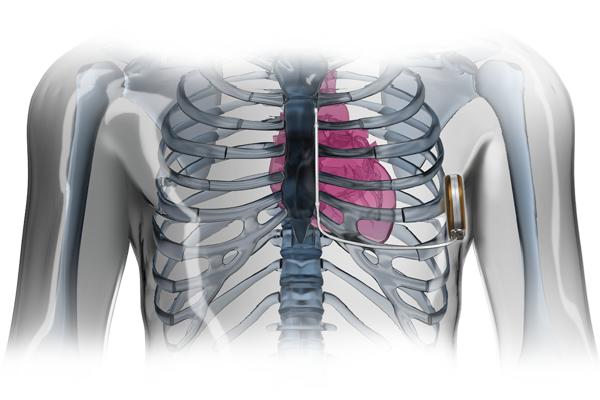 The new S-ICD System® is implanted just under the skin, instead of in the veins and heart. The S-ICD detects the heart’s rhythm from the outside and sends a life-saving pulse through the chest wall to the heart when the rhythm is abnormal. The S-ICD eliminates the risks of ICD complications from intravascular infections, intracardiac injury and from the need for future lead extraction procedures, which are the major downsides of the traditional venous ICDs. There is also less risk of the device being damaged by physical activity. Read about Sean, the first patient at CHOC to receive this life-saving device. Peace of mind is important and the pediatric cardiology specialists at the CHOC Children’s Heart Institute are with patients and their families every step of the way. We have put together the following frequently asked questions about kids and defibrillators to help patients and families better understand the devices and how they work. A pacemaker is a life-saving medical device composed of three parts: a pulse generator, one or more leads (wires) and an electrode on each lead. A pacemaker signals the heart to beat when the heartbeat is too slow or irregular. A pulse generator is a small metal case that contains electronic circuitry with a small computer and a battery that regulate the impulses sent to the heart. The lead (or leads) is an insulated wire that is connected to the pulse generator on one end, with the other end placed inside one of the heart’s chambers. The lead is almost always placed so that it runs through a large vein in the chest that goes directly to the heart. The electrode on the end of a lead touches the heart wall. The lead delivers electrical impulses to the heart. It also senses the heart’s electrical activity and sends this information back to the pulse generator. Pacemaker leads may be positioned in the atrium (upper chamber) or ventricle (lower chamber) or both, depending on the medical condition. If the heart’s rate is slower than the programmed limit, an electrical impulse is sent through the lead to the electrode and causes the heart to beat at a faster rate. When the heart beats at a rate faster than the programmed limit, the pacemaker generally monitors the heart rate and will not pace. Modern pacemakers are programmed to work on demand only, so they do not compete with natural heartbeats. Generally, no electrical impulses are sent to the heart unless the heart’s natural rate falls below the pacemaker’s lower limit. An implantable cardioverter defibrillator (ICD) is an electronic device that is surgically implanted just below the collarbone or on the side of the torso and is used to help control electrical problems with the heart. An ICD senses the rate and regularity of the heartbeat. When the heart rate exceeds a rate programmed into the device, the ICD delivers a small, electrical pulse to the heart to slow the heart rate. When the heartbeat becomes so erratic and disorganized that the heart muscle cannot pump blood from the ventricles, an ICD can deliver a stronger electrical pulse — often referred to as a “shock” — that can restore organized electrical activity, and therefore an effective heartbeat, to the ventricles. A defibrillator can record and store information about the heart rhythm and therapies delivered by the device for our specialists to review. This allows our cardiologists to have a better understanding of the specific issues going on in the child’s heart. 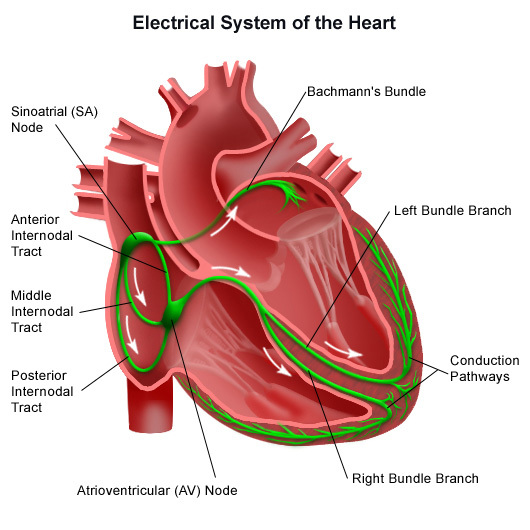 Learn more about the heart’s electrical conduction system. How is a defibrillator different from a pacemaker? A pacemaker is typically used to regulate a heart rhythm that is too slow and a defibrillator is generally used to regulate a heart that beats too fast. Some defibrillators can, however, be programmed to function as a basic pacemaker as needed. Sometimes after a defibrillator delivers a shock to the heart, it may beat too slowly. Some defibrillators have a “back-up” pacemaker that can stimulate the heart to beat faster until the normal heart rhythm returns. Additionally, some defibrillators can act as a pacemaker not only after a shock is delivered, but also any time the heart rate drops below a preprogrammed rate. Which types of heart problems require a defibrillator? Ventricular fibrillation. A life-threatening condition in which the ventricles contract in a rapid, chaotic rhythm and cannot pump blood to the body. Ventricular tachycardia. A serious condition in which the ventricles cause a fast heartbeat. Heart failure. The heart is unable to pump blood effectively to meet the body’s needs. Learn more about heart failure. Channelopathies. Genetic disorders caused by disturbances in function of the ion channels that can cause abnormal heartbeats and ECG changes that put children at a higher risk for sudden cardiac death. Which types of heart arrhythmias require a pacemaker? Bradycardia. Occurs when the heart beats too slowly. Tachy-brady syndrome. An arrhythmia in which the heart alternates by beating too fast and too slow. Heart block. Occurs when the electrical signal is delayed or blocked after leaving the sinus node; there are several types of heart blocks. There may be other reasons for a child’s doctor to recommend a pacemaker insertion. What are the risks of defibrillator or pacemaker insertion? Bleeding from the incision or catheter insertion site. Damage to the vessel at the catheter insertion site. Infection of the incision or catheter site. The condition pneumothorax. If the lung is accidentally punctured during the procedure, air gets trapped in the space between lung and chest wall. This can interfere with breathing and in extreme cases may cause the lung to collapse. Caregivers should notify the patient’s cardiologist if the child has an allergy or sensitivity to medications or latex. How can a family/patient prepare for the defibrillator or pacemaker insertion procedure? Details on any sensitivities or allergies the child may have to medications, iodine, latex, tape or anesthesia. A list of all medications (prescription and over-the-counter) and herbal or other supplements. Details on any other medical conditions the child is currently experiencing or has had in the past. At this appointment, the child’s legal guardian will be asked to sign a consent form that gives the cardiologist permission to do the defibrillator insertion. It is important to read the form carefully and ask questions if something is not clear. The child’s doctor will also provide details on fasting (not eating) before surgery, any blood tests needed prior to the procedure and information on how long the patient may stay at the hospital. What should a patient expect the day of the procedure? A defibrillator or pacemaker may be inserted on an outpatient basis or as part of an overnight stay in a hospital. The length of the child’s hospital stay will be discussed at the final appointment before the procedure. All patients are admitted to the Tidwell Procedure Center at CHOC Children’s and are asked to arrive two hours prior to the scheduled procedure. Learn more about checking in and what to expect at the procedure center. Patients are prepared for the procedure in the preoperative unit (also called “pre-op”) before being taken to the surgical room. While in pre-op, patients may receive an IV, change into a hospital gown and be given a slight sedative to help them feel less anxious. Once taken to one of our state-of-the-art operating rooms, the child is connected to an electrocardiogram (ECG or EKG) monitor that records the electrical activity of the heart and monitors the heart during the procedure using small, adhesive electrodes. The child’s vital signs (heart rate, blood pressure, breathing rate and oxygenation level) are monitored throughout the procedure and an anesthesiologist will be present the entire time to keep the child comfortable. The device insertion site is cleansed with antiseptic soap and sterile towels and a sheet will be placed around the area. A local anesthetic will be injected into the skin at the insertion site. Once the anesthetic has taken effect, the cardiologist will make a small cut at the insertion site.For traditional ICDs, a sheath, or introducer, is inserted into a blood vessel, usually under the collarbone. The sheath is a plastic tube through which the lead wire is inserted into the blood vessel and directed toward the heart. Once the lead wire is inside the heart, it is tested to make sure it is in the right spot and that it works. Depending upon the child’s condition, more than one lead wire may be inserted. Fluoroscopy, a special type of X-ray displayed on a TV monitor, may be used to assist in testing the location of the leads. The defibrillator or pacemaker is slipped under the skin through the incision (just below the collarbone). Generally, it is placed on the nondominant side. Children who are right-handed will have their device placed in their upper left chest. Children who are left-handed will have their device placed in their upper right chest. For subcutaneous ICDs, a small pocket is formed under the skin on the side of the torso, and the pulse generator is placed. Two small incisions are then made near the breastbone to allow the electrode to be placed under the skin and attached to the pulse generator. Fluoroscopy is not needed for the insertion of a subcutaneous ICD. The electrocardiogram is monitored to ensure that the defibrillator is working correctly. Once the doctor is certain that the device is working properly, the skin incision is closed with sutures, adhesive strips or special glue. What can patients and families expect after the insertion procedure? Can get out of bed with assistance. The nurse will assist the patient and will check the child’s blood pressure while lying in bed, sitting and standing. Are able to eat or drink once completely awake. Experience soreness or pain at the insertion site. The child will be provided pain medication as needed. What happens when a child comes home from the hospital with a defibrillator or pacemaker? Palpitations (fast or irregular heartbeat). The child’s doctor may give additional instructions after the procedure, depending on the child’s particular situation and all patients are closely monitored by our Pacemaker and ICD Program. Pacemakers and cardioverter defibrillators are used to regulate some forms of irregular heartbeats caused by problems with the heart’s electrical system. Learn more about the heart’s electrical system and arrhythmias. In this segment of American Health Journal, Anjan Batra, MD, FHRS, explains irregular heart beats in children. In the newborn population, there are many heart conditions that may need surgery. How to prepare patients of all ages for surgical procedures—from infants to young adults. How caregivers will need to prepare for the procedure. What to expect the day of the procedure.